The Sixth Doctor is unabashedly the most grandiloquent and loquacious of the Doctor’s incarnations, reveling in his knowledge and command of the English language as he continually confronts danger and attempts to put right the wrongs plaguing the universe. Accordingly, pairing him up with the very language-centric Carrionites of the Tenth Doctor story ‘The Shakespeare Code’ seems an obvious choice, allowing the moments of ostentation from both hero and villains to play off each other naturally while revealing a surprisingly serious tale. With terrifying forces on the loose and even more dangerous secrets being kept hidden, witch trials return to the Midlands in the 1980s. The juxtaposition of a traditional witch trial in such a contemporary setting is a fantastic conceit, and the prospect of ordinary people coming to terms with the witchcraft around them while their locale’s history collides with the present creates a strong backbone for the story to build upon as the Carrionites reveal themselves and the Doctor becomes increasingly involved. ‘The Shakespeare Code’ managed to imbue quite a lot of history about this witchlike race for their introduction, establishing the fourteen-star system from which they originated as well as their word-based science and some of the rules governing it. Yet without the visual assistance that television allows, writer Simon Guerrier has focused on crafting slightly more grounded versions of the foes while further exploring their strengths and weaknesses, showcasing the power that authority and even pithy words can have as the foes look into the future and form surprisingly strong links on Earth. The audio stylings of the Carrionites transfer effortlessly to the audio medium thanks to some strong vocal performances, but putting the focus as much on the humans trying to save themselves as on the villains trying to overrun them keeps events from ever becoming too flashy, something the very appearance of the Carrionites threatens, and brings together several different plot threads satisfyingly as events progress. Once the plot veers away from the opening scene of a trial that may put some listeners in mind of the previous Classic Doctors, New Monsters Sixth Doctor tale ‘Judoon in Chains,’ ‘The Carrionite Curse’ boldly goes down its own path that bombastically brings past, present, and future together, a clash in which not everyone can escape unscathed despite the Doctor’s best efforts. Colin Baker seems to exult in this language-driven script, and his Doctor has rarely seemed so confident in his own actions and capabilities even when he does not fully understand what is happening around him. Maya Sondhi’s Katy Bell is the perfect de facto companion to stand alongside him as her bravery and compassion shines through, and she in turn brings the Doctor’s compassionate valour to the forefront gloriously, even as the Doctor must come to accept the consequences of his actions following seeming victory. The small ensemble brings the small town to life wonderfully as past grievances must be put aside for the greater good, and there is a much greater scope to events than the small setting would otherwise suggest that makes the story all that much stronger. Each of the stories in this range is undoubtedly a love letter of sorts to the modern series story from which the respective villain stems. Naturally, it’s expected that there should be many references- both subtle and overt- to those episodes, and ‘The Carrionite Curse’ certainly pays tribute to ‘The Shakespeare Code’ abundantly, referencing the Globe Theatre and the importance of the number fourteen in rather key moments as events tie into the Doctor’s personal future. As satisfying as these references are, however, the throwaway mention of Rowling and the inclusion of the ‘C’ chest in the TARDIS seem somewhat intrusive, not adding much to the story except for an overt reference to its predecessor. 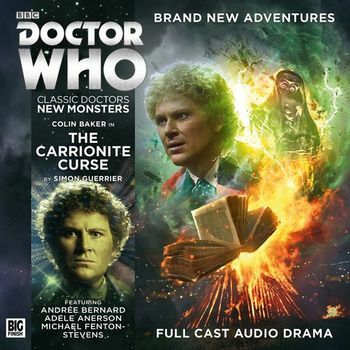 Still, with that being a subjective quibble, ‘The Carrionite Curse’ as a whole is a strong reintroduction of a very unique force within the world of Doctor Who. The Carrionites are quite visual by nature with their full menace unable to fully manifest in audio, and there still remains a bit of haziness about just what can affect them and to what extent, but the essence of the foe is unquestionably strong enough to carry a well-paced, well-directed, and well-scored story through to its poignant resolution.